326 pages | 32 B/W Illus. The Elements of Inquiry covers the basic guidelines for graduate students doing an investigation or inquiry project. 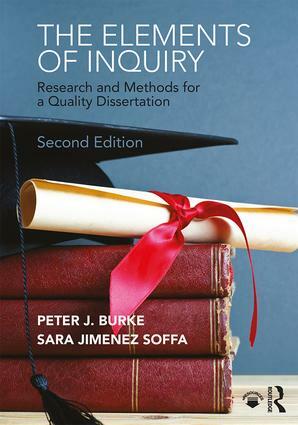 It distils the rubrics necessary for teaching research methods and completing research projects, and gives the student researcher a list of steps to follow to complete any type of inquiry project – including formal research projects such as doctoral dissertations. It was written to support the work of students in an educational leadership doctoral program, but it will also assist the research efforts of college students at any level in any discipline. The book begins by establishing the underlying philosophical concepts upon which all good research is based, preparing students to get down to the "nuts and bolts" of conducting their own research and evaluating the research of others. Fundamental concepts and rules of research are explained both for producers and consumers of social science and educational research. Numerous practical examples illustrate the steps in the research process presented in the text. There are end-of-chapter exercises for students to apply the concepts discussed in the chapter. Templates for organizing and presenting research provide students with a game plan for success with their research. The book ends with an up-to-date annotated bibliography of beginning and advanced research texts allowing students easy access to books that detail the more specialized research topics. While most research books detail one or more method in depth, this text provides a broad introduction to many techniques and models used in doctoral dissertations, and will be of particular value to those who are consumers of inquiry studies and research reports. Key to the overview provided is the annotated bibliography that leads the reader to the next stage of understanding or doing research. Peter J. Burke is Director of a graduate program in educational leadership and a faculty member in the Education Department at Edgewood College in Madison, Wisconsin, USA. He is author, co-author, or co-editor of four books, five monographs, several book chapters, and numerous articles in professional journals on topics such as leadership, school improvement, teacher growth and development, and the supervision of instruction. Sara Jimenez Soffa is Director of Research and Associate Professor of education for the doctoral program in educational leadership at Edgewood College in Madison, Wisconsin, USA. She was previously Coordinator for the Higher Education and Agency (IHE) educational leadership concentration for the doctoral program in educational leadership (Ed.D.) at Edgewood College.